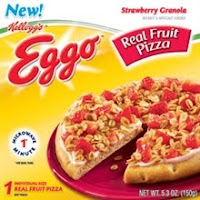 Update: It appears that this product has since been discontinued - As of 12/2011 I cannot find information on either fruit pizza on the Eggo website. Please visit to view the other fabulous Eggo products. Oh my goodness, you cannot possibly tell me that that doesn't just look yummy!! 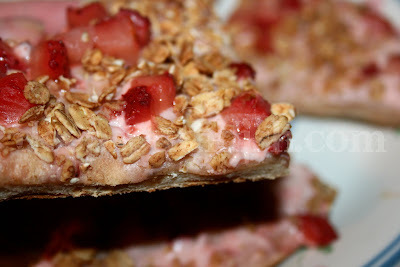 Thanks to the Foodbuzz Tastemakers program I had the opportunity to give these new Eggo Real Fruit Pizzas a taste test in both the Strawberry Granola and Mixed Berry Granola flavors. With school just about to kick in and the hurry-up rush that always seems to come with it ... no matter how organized you think you are ... these are gonna be a great way to get a nutritious meal in your kids - or yourself before heading out the door. I'll be honest. I had initially planned to try these out on some youngsters myself, but decided to go ahead and give them a spin myself - and boy, I'm really glad I did! I honestly wasn't sure how this product was going to translate taste-wise, but gotta say I really was impressed! These are individual sized personal pizzas, so they're perfect to keep on hand in the freezer. The crust, which I initially expected to be an Eggo waffle, is actually more pizza-crust like, except that it is lightly sweetened with cinnamon and maple flavors. 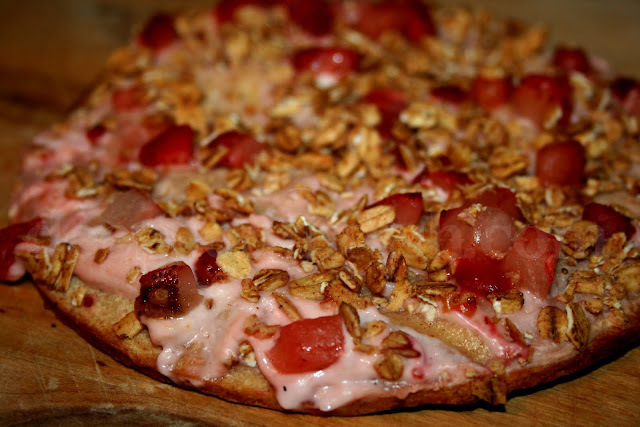 That's topped with what appears to be a flavored, neufchatel cheese base, and then crunchy granola and real fruit. One minute in the microwave on the crisping tray that is provided and you've got a quick, tasty and convenient breakfast option for those rushed mornings. I'm not a big fan of cooking in the microwave, particularly with pizza crusts, so I chose to cook mine in the oven for a crispier crust, but these are a perfect size for the toaster oven too. It takes only 5 to 7 minutes, placed directly on the oven rack and allowed to cool for about a minute. Loved that crunch! These really would be a nice change from cold yogurt, cereal, or even a snack bar - give 'em a try! I have a feeling you'll love them too. 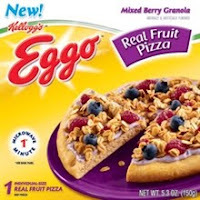 Disclosure: As part of the Foodbuzz Tastemaker Program, I received Eggo Real Fruit Strawberry and Mixed Berry Real Fruit Granola Pizzas to try. 8 HUNGRY PEOPLE COMMENTED. ADD YOURS! Different! Should be a hit with kids! Funny story - I adopted my daughter's from Vietnam and they didn't speak any English. My middle daughter (she was 8 at the time) said her first complete sentence "let go my eggo". The pizzas look good. I wonder what they will retail at pricewise. When you have several kids that quickly becomes a factor . Agreed Eva and Magic - and sometimes that itself is worth having something like this on hand. Pam, that is hilarious. My dad used to say if only we could memorize our school work like we did the TV jingles! Yeah Anony, I have not priced these out at the market but definitely agree on the price issue, because you usually pay for the convenience that's for sure! For some the cost is worth that! That said, I do think that coupons are generally available for convenience products though, so that would certainly help to defray some of the cost. I would keep my eyes open for that! Warm foods are just so great to get you out of bed and going on winter days. Now is that yogurt that they use as a sauce? Hi! I'm not sure what the composition of the base was but I do believe it was a a flavored, neufchatel cheese base based on the product information. It was certainly thicker than an off the shelf yogurt would be. That said, I just checked the website & it appears that since this review was posted, this product has apparently been discontinued. So sorry, but thanks so much for stopping by & hope that you come back by and check out some of our recipes! New Zatarain's Products Spice Up Kitchens!